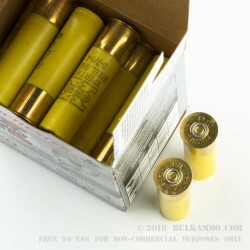 The kind of shotshell that was made specifically for duck season, this is a 3” 20 gauge load with the shot size, cup weight and velocity that you need when working with steel shot for waterfowl. It’s a thing of beauty out of a 20 gauge made for the birds we love to hunt. #4 shot is a perfect shot size for this wetlands work and in the 7/8 ounce wad, it provides adequate bulk for dense patterns and to avoid wind deflection. The 1500 feet per second velocity ensures the cup gets out to the flock fast enough to do its work properly before the wind drag can disseminate all the steel shot. 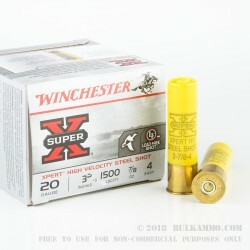 This round works admirably for a steel shot shell, with a 20 gauge build, even if it is a big 20 gauge load. The yellow hull on this load makes it unmistakably a 20 gauge. There have likely been times where that has saved some embarrassment or a trip back to the cabin for some hunter. 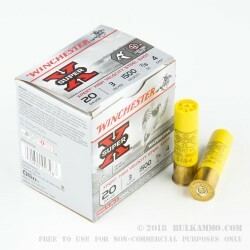 It makes it easily distinguishable from the red shotshells made famous by Winchester. 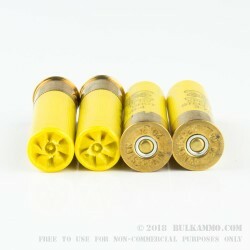 This cartridge is a 3” 20 gauge shot shell suitable for use in only firearms marked for 3” 20 gauge shells.